When we first talked with Splash.FM’s co-founders, Jason Fiedler and Alex Gatof, last summer about building a music and influence-driven website, we were more than intrigued by their concept and passion for developing it. 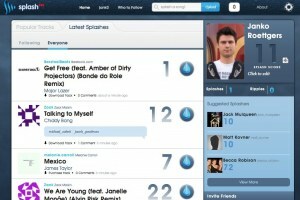 In concept, Splash.FM was the “Klout for music”, a social network based on music discovery with the unique addition of an algorithm that would score users based on how influential their recommendations were. As a bonus, users could share and download music, making it the ultimate network for new music artists too. Together we worked with them on design, strategy and development to bring this to fruition in just a few short months. Splash.FM launched in private beta on January 16th with hundreds users and had thousands of users by the time we cut the tape and went live on Tuesday, April 17th. Needless to say, we’re pretty pumped about the launch and all the well-deserved media attention that Splash.FM is getting. Gizmodo called them a full-featured entrant into the world of what Billboard dubbed the “Twitter for music” category. Meanwhile, GigaOM and co-founder Jason Fiedler agree it’s more of a Klout for music discovery, given the “splash score” that represents how influential you are in terms of discovering music. In the coming months, we’ll be working on more improvements to the site and listening to what the early adopters have to say. Jason and Alex have been some of the most fun and passionate clients we’ve worked with, so it’s exciting to watch the site become such a success! And if you haven’t yet, sign into Splash.FM quickly with Facebook, Twitter or good old-fashioned email.